What's the deal with the Lake Park bridge? What’s the deal with the Lake Park bridge? Last summer, Milwaukee’s Lake Park found itself at the center of a deliciously bizarre/idiotic controversy involving men, women, and weeping children arguing about Pokemon. But there was another Lake Park controversy brewing at the same time, albeit one with a bit more historical significance and far less Jigglypuff jokes. The future of the park’s Ravine Road Bridge (or just “Lake Park bridge” if you’re nasty) was also the subject of much fevered debate, and continues to be a prickly subject to this day. So what’s the deal with the Lake Park bridge? Well, for starters, it’s closed. Located near Bartolotta’s Lake Park Bistro, the historic footbridge was first closed for “emergency repairs” in 2014, following the discovery of cracks in the concrete and soil erosion around the end supports. (The section of Ravine Road below the bridge, which connects the lakefront and Lake Park’s bluff areas, was closed as well.) Large concrete blocks were stationed on both ends of the bridge, warding off bicyclists and folks not crafty enough to squeeze between the blocks. In recent months a full chain link fence has been installed. In all, the bridge has been in some state of closure for nearly three years. • The concrete arch footbridge spanning Ravine Road (1905) was designed by the famous Wisconsin architect Alfred C. Clas who was also at that time a Park Commissioner and who along with his partner George Bowman Ferry also designed hundreds of famous buildings including Milwaukee’s Central Library, the State Historical Society headquarters building in Madison, the Frederick Pabst Mansion in Milwaukee and the First Unitarian Church in Milwaukee. • The footbridge is but one structure in a cluster of structures designed to fit together stylistically and functionally, including the Pavilion (1903) and the Grand Staircase (1908). In the Feb. 15 meeting, [Milwaukee County Sup. Sheldon] Wasserman and county administrators advocated building a replica bridge, estimated at $2.5 million, which they say may cost less than rehabilitation over a “100-year life cycle.” Proposed rehabilitation options are estimated at $1.8 million and $2.3 million. Wasserman outlined how he had enlisted more county funding—from $500,000 to over $1 million—for a bridge project. He believes that’s the maximum the county would allocate. He also said that three private donors, all anonymous, have approached him. Donations of $100,000 and $500,000 reportedly have no strings attached, unlike the million-dollar pledge. Do Milwaukeeans care about their Frederick Law Olmsted-designed parks and the current and potential value they offer? 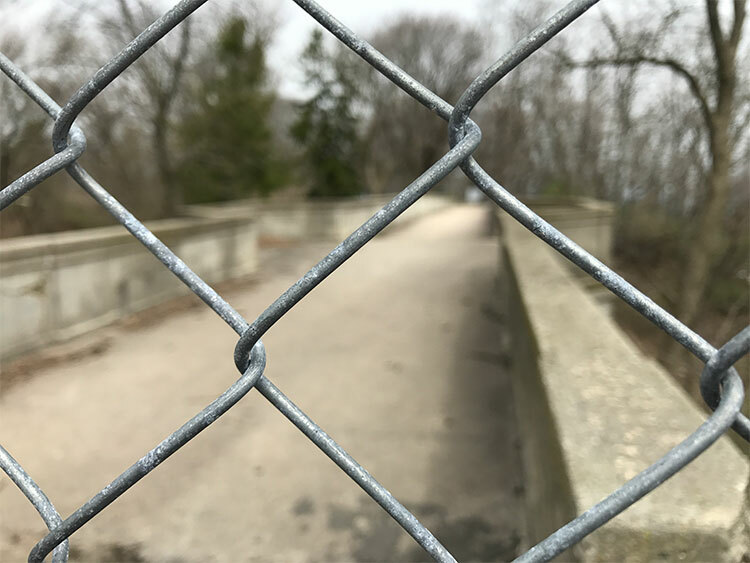 If the answer is yes, the debate about preserving the elegant Ravine Road Bridge in Lake Park deserves the attention of every concerned citizen. True, in a list of pressing Milwaukee issues, the future of the bridge probably lands somewhere between saving the Mitchell Park Domes and changing the official city flag to a Corona logo. But all of those issues are extremely important when considered alone, and Milwaukee County’s oft-declared love affair with its parks system knows no bounds. Is replacing the Lake Park bridge more preferable than repairing it? Vice versa? That’s a matter of opinion, but three years on, the issue is quickly approaching “anything is better than a chain link fence” territory.